The aim of this paper is to prove that the average function of a trigonometrically ρ-convex function is trigonometrically ρ-convex. Furthermore, we show the existence of support curves implies the trigonometric ρ-convexity, and prove an extremum property of this function. This property is called a trigonometric ρ-convexity ([1,2]). In Theorem 3.1, we prove this result in case of trigonometrically ρ-convex functions. 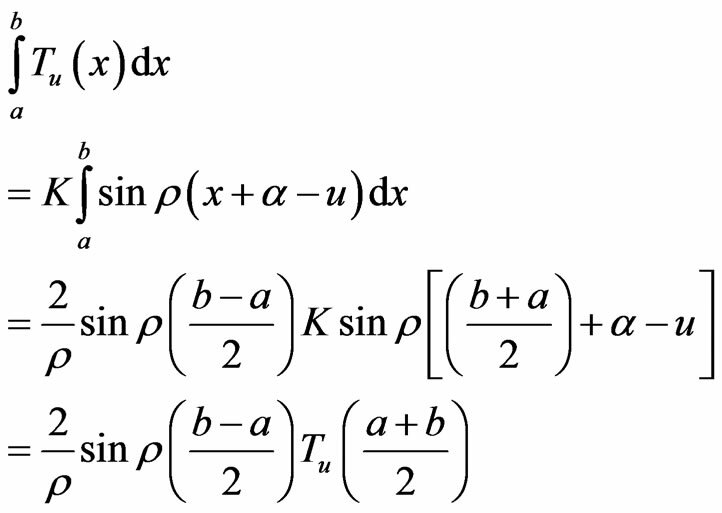 In Theorem 3.2, we prove the extremum property  of convex functions in case of trigonometrically ρ-convex functions. And finally in Theorem 3.3, we show that the average function  of a trigonometrically ρ-convex function is also trigonometrically ρ-convex. In this section we present the basic definitions and results which will be used later , see for example ([1,2], and [6-9]). The trigonometrically ρ-convex functions possess a number of properties analogous to those of convex functions. That is, if and agree at and the graph of does not lie under the support curve. Property 2.1. Under the assumptions of Theorem 2.1, the function is continuously differentiable on with the exception of an at most countable set. Then is trigonometrically ρ-convex on . Two cases arise, as follows. Therefore, from Property 2.2, we conclude that the function is trigonometrically ρ-convex on . Theorem 3.1. 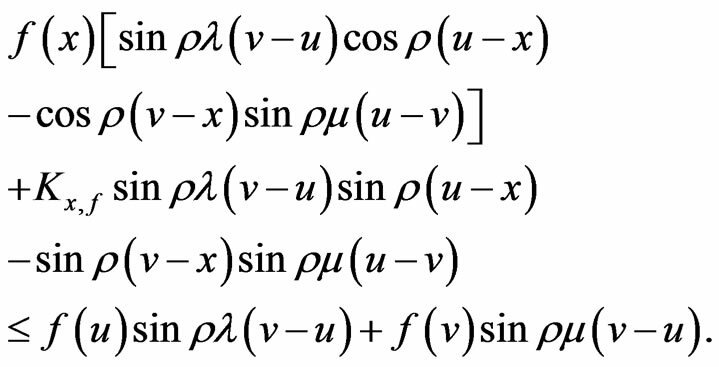 A function is trigonometrically ρ-convex on if and only if there exists a supporting function for at each point in . Proof. The necessity is an immediate consequence of F. F. Bonsall . where is a fixed real number depends on and . for all which proves that the function is trigonometrically ρ-convex on . But from (8) ,we observe for all . Then, is trigonometrically ρ-convex function. Proof. The proof mainly depends on Lemma 2.1. So, we show that the function satisfies all conditions in this lemma. First, we study the behavior of the function inside the interval . It is clear from (12) that s is an absolutely continuous function, has a derivative of third order. Using the following substitution . From the definition of in (14) and the periodicity of we observe that and . and the inequality in (18) is proved. Now using (17), (18), and Lemma 2.1, we conclude that is trigonometrically ρ-convex function, and the theorem is proved. The author wishes to thank the anonymous referees for their fruitful comments and suggestions which improved the original manuscript. B. Ya. Levin, “Lectures on Entire Functions,” American Mathematical Society, 1996. L. S. Maergoiz, “Asymptotic Characteristics of Entire Functions and Their Applications in Mathematics and Biophysics,” Kluwer Academic Publishers, New York, 2003. A. W. Roberts and D. E. Varberg, “Convex Functions,” Academic Press, New York, 1973. A. M. Bruckner and E. Ostrow, “Some Functions Classes Related to the Class of Convex Functions,” Pacific Journal of Mathematics, Vol. 12, 1962, pp. 1203-1215. M. M. Peixoto, “On the Existence of Derivatives of Generalized Convex Functions,” Summa Brasilian Mathematics, Vol. 2, No. 3, 1948, pp. 35-42.